The impeccable sound of the Accession takes music from vinyl and sets it on a new higher pedestal–it’s what all vinyl lovers will want to hear. Previously overlooked technology has been perfected to extract much more of what’s hidden in the music on vinyl records. The resulting sound from the Accession is considerably closer to the music laid down at its recording. Record equalisation is quite a convoluted process complicated by historical and physical technical limitations—for records to work at all required some considerable compromises simply to cut and press the groove. This is why record EQ exists and why the phono preamp has the job of correcting it. But there’s something else contributing to the EQ which the phono preamp has to correct—the actual cartridge being used to play records has a rising response. Here we’re not talking about something subtle—it is a real rising response few understand—the cartridge output is rising at a rate of 6dB per octave, a 45 degree slope, and it’s completely different to the EQ applied to the record. Even so, ever since the magnetic cartridge came on the scene—the cartridge type we all use today—phono preamp designers have looked at the combined EQs of record and cartridge as being one. Treating the two quite different EQs separately, the Accession first strips away the cartridge’s contribution to the frequency response. It then deals with the record EQ. Thinking about it, the record’s own EQ was applied when the record was recorded, and even if you just bought the record you’re playing today that event happened some time ago—whereas the phono cartridge is applying its rising response in real time now as the record is playing—these are two completely separate events in time. The combined “EQ’s” make up a complex curve of different slopes pictured below. The solid black curve is the signal the phono preamp receives at its input. 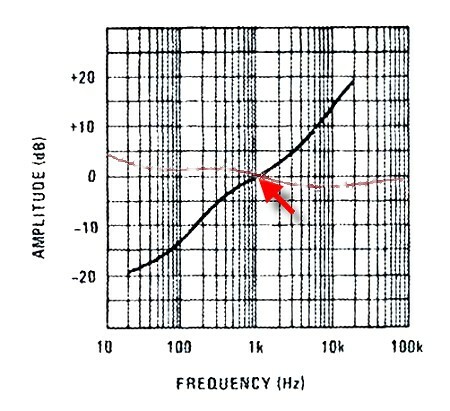 If we can EQ the contribution from the cartridge and amplify it, the curve will rotate 45 degrees to the right as shown by the faint broken red curve. This is what the Accession does. It “EQ’s” the cartridge first of all so all that is left to do is EQ the record’s contribution, which it does in its second stage. Rotating the curve only takes a single opposing filter slope to do the job. It just so happens that a handful of solid-state amplifying devices have an open-loop frequency response which match the required slope perfectly, making the amount of negative feedback required constant at all frequencies on the slope. This is really important because that constant negative feedback makes the input and output impedances constant too. The cartridge “sees” a constant load and that’s quite different to the conventional way of doing things—it makes a big difference to how it sounds. But it’s not purely subjective. High frequency distortion just melts away… just 0.002% THD at 10kHz on the Accession’s fixed outputs. That’s objective! The package of features the Accession phono preamp provides makes it really flexible allowing it to fulfill a number of roles. In a frugal or minimalist vinyl only system the volume control lets it drive a power amp (we suggest a pair of Proprius), and the fixed outputs can drive a headphone amplifier. As part of a “traditional” system the variable outputs can be used into an ADC or sound card to do “vinyl rips” while the fixed level output is connected to your preamp, integrated amp or receiver for normal listening. The different record EQ possibilities make it great for archival duties if you have old mono LPs and EPs which don’t sound quite right. Possibly the biggest problem encountered in digitising vinyl is the wrong level of signal. Too much signal overloads the input of the A to D converter (ADC) resulting in a hard clipped sound which ruins your efforts. Using an “L-pad” (an attenuated interconnect cable) can help but with quieter records you’ll be recording several bits down. A volume or output level control is the answer, but it’s got to be followed by a buffer stage to get the impedance low enough to suit the ADC input, or the results won’t be right. The Accession gives you both. The output level control is followed up by a high quality discrete transistor buffer stage which gives you the low impedance drive your ADC expects. The fixed level output allows you to monitor what you’re recording by connecting it to your main system, or to a headphone amplifier, as you record from the variable output. Not only is the volume control and buffer stage of use for digitising vinyl, but it’s the answer for those who only want to play vinyl and want the bare minimum of system components. All that’s required is a reasonably sensitive power amp for the Accession to drive. Partner it with a power amp and cartridges outputting ≥ 4.5mV (ref 1kHz at 5cm/sec) will be sufficient to reach high volumes with excellent sound quality. The Accession’s output buffer stage was developed specifically to prevent input saturation from ruining the clean signal from the phono preamp section. It handles the full post EQ peak to peak signal without any slew-rate limiting. Older mono records can sound a bit muffled or a bit too bright and if that happens you’ll find it’s because they were not recorded to “modern” RIAA characteristics like you get on stereo records. Up to the mid-1960s best-quality “gramophone” record reproducers featured tone correction switches to equalise the different record tone characteristics, and for vinyl it boiled down to American and British versions competing with their different EQs. Because many older users will have some of these records—LPs, EPs and even singles—in their collections we saw it fit to include a switch to equalise them, as well as a mono switch for authenticity. We’re often asked if we can make a “flat” phono preamp for digitising acoustic records, but that implies a phono preamp without any EQ at all. What you want is something which reproduces the record’s characteristics only and that’s exactly what the Accession phono preamp does if you switch it to its “Flat/CA” position (CA: constant amplitude). It’s not only acoustic records which can be played this way—all records can—and during digitisation the EQ of your own software can be applied. Not that it should be needed, because in our opinion 100pf is ideal for the vast majority of MM cartridges when combined with the 50pf to 100pf of arm and cable capacitance. But as the Accession is made as a tool to extract maximum information from vinyl records we’ve included four capacitive load settings for you to experiment with. The effect on sound will be to take the high frequency peak in the 10kHz to 20kHz region lower or higher, making the peak larger or none existent, between the maximum loading and minimum loading, respectively. The Accession is designed for high output cartridges, but if you want to use low-output MC too, partner it with the Elevator EXP Step-Up for an unbeatable all-cartridge phono preamp combo. The Accession phono preamp is supplied with our outboard PSU1 (our best) power supply, with a choice of supply voltages and power cords.